THREE RIVERS, Calif. — Sequoia National Park is one of the few places in the world with giant sequoia trees, including the General Sherman Tree — one of the largest trees on earth. As America’s second-oldest national park created in 1890 one week before neighboring Yosemite became a park, it still preserves a landscape before Euro-American settlement. Crescent Meadow in the late afternoon of a mid October day (Staff photo). Sequoia National Park provides visitors with numerous choices to explore the sequoia trees and enjoy the wilderness. Giant Forest area is no doubt one of the best with General Sherman Tree and Giant Forest Museum — great place to learn more about sequoias. However, in the midst all those large forest trails, I just cannot help being attracted by a little meadow within the Giant Forest — Crescent Meadow. 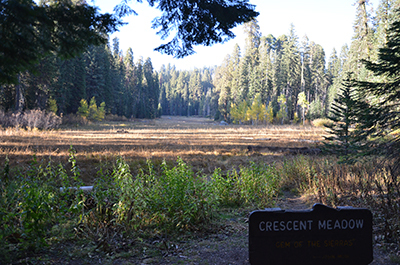 Located in the middle of the Giant Forest and just a short drive from the Giant Forest Museum and Tunnel Log, Crescent Meadow’s existence adds some mild flavor to the dense forest of immense trees. When you get overwhelmed by those compacted huge trees, a little meadow’s appearance will give you some open space to breath, meditate and relax. During my brief trip in Crescent Meadow, I kept taking photos — trying my best to restore the beautiful scene in my smartphone and hoping I can take it back to share with friends and family members. However, photographs cannot even show the full beauty of this incredible meadow. There was not many flowers left when I visited during mid October, but I saw those withered wildflowers in the midst of the green and yellow grass with a fresh breeze and sunshine was already an amazing experience. However, I was told that if I visited earlier, there would be shooting stars and leopard lilies in early season, lavender lupines in the middle of summer, and bright spears of meadow goldenrods near at the end of the summer. Trails to Crescent Meadow are paved and clear, making for an easy walk (Staff photo). Green and yellow are the most common colors of the meadow in fall, but it did not appear dull at all. Lime, olive, basil, gold, butter and lemon — a full collection of different kinds of green and yellow mixed together already — made the meadow seem filled with vitality. What is more, some small, unidentified red and orange plants grew along the walkway and added more small surprises. Marine never got bored with this little meadow. She kept visiting while she lived in Three Rivers and explored the meadow at different time. Even Marine has been away from Three Rivers for years, she still went back to the meadow several times a year with her children and grandchildren. 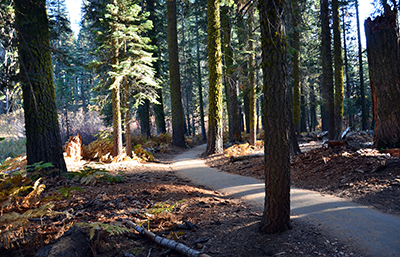 The paved starting path of Crescent Meadow coincides with the famous High Sierra Trail, a backpackers’ favorite, but soon with the signs for “Tharp’s Log,” the route separates from the Sierra Trail to the fringe of Crescent Meadow. Around the meadow was a little forest. Sequoia trees grow freely all over the forest. Some tall, some small, some have been damaged by the bugs, and when you put all of this together, what you see is the beauty of a preserved natural view. Some random logs fell on the earth add more fun to my trip. One of the logs has broken into two with a walkable space in between. My friend, Jamie, got excited when she saw it and took a picture standing in the middle of the broken log. Near the upper end of the meadow, the trail reaches Tharp’s Log — a cabin made from a fire-hollowed giant sequoia by Hale D. Tharp. It was amazing to see how Tharp converted the whole sequoia into a living cabin with complete basic functions. Tharp was one of the first settlers in the Three Rivers region. He first visited the Giant Forest in 1858 accompanied by two Indians. He converted the old log into a cabin and lived there each summer from 1861 to 1890 to graze his livestock. He ceased using the site when Sequoia National Park was established. I continue walking. and entered into the other side of the meadow’s loop trail. Continuing the forest view, breathing the fresh air mixed with the smell of sequoia trees, looking at the blue sky and the orange sunshine and listened to the unknown birds’ singing. Where: On the Generals Highway, drive 15.9 miles north from the Ash Mountain south entrance station, or 2.1 miles South from General Sherman Tree area to Crescent Meadow Road. Turn east and follow the road for 2.5 miles and the Crescent Meadow parking area is at its end. Trail Surface: Partially paved and dirt. Best Hikes for: Giant sequoias and children. Facilities: Restrooms, water and a picnic area available.